Ireland’s best-known architect Dermot Bannon showcases some of the world’s most amazing homes. From sunny Sydney to London city, from stylish Melbourne to the snowy landscape of northern Sweden, Dermot explores how people live around the globe in this four part series. First up it's Sydney. In the new series of “Dermot Bannon’s Incredible Homes”, Ireland’s best-known architect showcases some of the world’s most amazing homes. From sunny Sydney to London city, from stylish Melbourne to the snowy landscape of northern Sweden, Dermot explores how people live around the globe in this four part series. Sometimes it is the homes themselves and sometimes it is the people behind the homes that are the star of these shows. A city pad worth £30million in Mayfair in London, a cave inspired house that has a 3 metre python in the rainforest back garden, an isolated log cabin in snowy Sweden and a massive poly-carbonate structure with a swimming pool in the bedroom are some of the more unusual houses that Dermot visits. 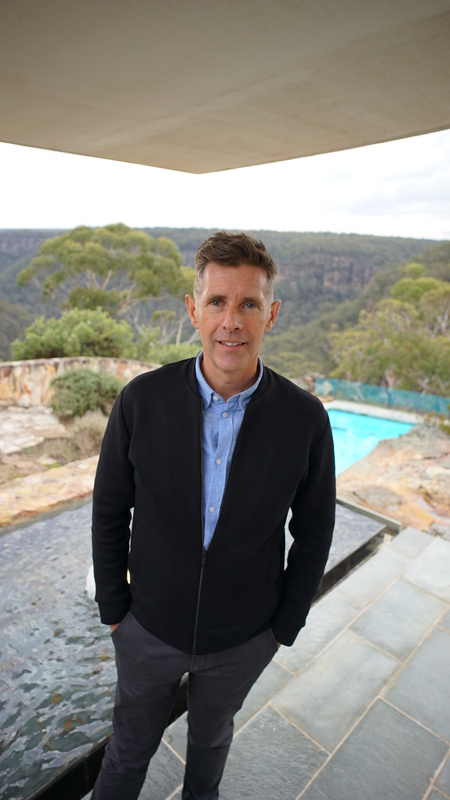 In episode 1, Dermot visits the award winning Cabbage Tree House, a stunning home embedded in the hillside of the suburbs of Bayview in Sydney’s Northern Beaches. Designed by Peter Stutchbury, the cave-like house, with its outdoor bath and breath taking views, is home to Jan and Graeme Page. The 200 square metre house sits on 20,000 square metres of rain forest, half of which the owners haven’t got to see yet. “The gardeners come three times a week”, Graeme says. “It’s like living in a national park”. A family of koala bears, a 3 metre python, lizards and wallabies live in the back garden of Cabbage Tree House. The walls of this house are brick, the floors and ceilings are concrete, there are no added finishes, no paint or wallpaper. Graeme and Jan were both surprised by the design that Stutchbuty created. He chose to build into the sloped rock rather than the flat. As the owners say, it might not be the right fit for anyone else, but for them it is perfectly tailored and is exactly everything that they need and want. 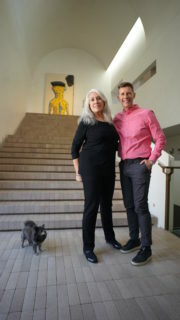 Dermot visits the home of the elusive and enigmatic Judith Nielson, one of Australia’s wealthiest people. Judith is a multi millionaire art collector and philanthropist, who only recently set up a $100 million fund supporting journalism. Judith named the house Indigo Slam before it was built. Taken from the title of a crime novel, Nielson still hasn’t read the book and doesn’t intend to. She buried a copy of the book beside the front door. Initially she said she wanted the best house in Sydney, a few weeks in this turned to the best house in Australia and then it was the best house in the world. It’s safe to say there is nothing like Indigo Slam. During his visit, Dermot sees the massive staircase Judith built that “you could ride a horse up”. He sits with Judith at the dining table that seats 60 people and he, shall we say, drools at the custom made furniture that fills this cathedral like house, including the dog-beds for Judith’s two dogs, Wasabi and Cumin. Dermot spends a day in the world famous Harry Seidler House, which is one of the most iconic homes in Australia. Seidler was born in Vienna, the son of a Jewish clothing manufacturer. He fled as a teenager to England when Nazi Germany occupied Austria in 1938. Seidler’s parents migrated to Sydney and in 1948, his mum wrote to ask him to come over to design their home. He had no intention to remain in Australia but the house created huge publicity and launched his career there. Built in virgin countryside near the top of a deep valley with a winding river below, this house is perched against a rock cliff with a suspended living area and projecting balcony overlooking the dramatic natural setting. Dermot has the house to himself for the day, and makes the most of it! The Cliff House is owned by Lisa and Ralph Mobbs and designed by Renato D’Ettorre. From the street, you feel that this property is perhaps something special, but nothing can prepare you for view. People expect the sea and horizon view when they come to the house because of its location but they are not expecting the whole of Gordon’s Bay, and this is the first thing that hits you when you turn the corner. It’s quite shocking to literally look down and see this intense patch of blue of the bay, framed by a terracotta wall. The house is very detailed but there is no fat on the building. It is highly bespoke. There was lots of excavation and demolition, which meant that the project took 4 years to complete. Half of the house is subterranean and the exposed cliff face that is part of the interior is awe inspiring. There’s no point in going to Australia and not attempting to catch some waves – in this episode we see Dermot Bannon learning to surf, but it’s not so much ‘hanging five’ as hanging on for dear life. And with a large contingency of Irish living in Australia, Dermot visits the “The Doss House”, a bar which was formerly an opium den, situated in The Rocks. Owned by Colm O’Neill, from Waterford, Dermot is shown around this underground whiskey bar, that was sympathetically restored by Colm and his business partner Eoin Daniels. Dermot learns from Colm the history of this fascinating area, where convicts were put to work on stone masonry, the results of which can still be seen in “The Doss House. He also manages to fit in a Skype call with Colm’s parents back in Waterford. Of course the Mammy is a fan of Dermot’s!